News of the near-total destruction of the Eternal Alliance fleet has spread quickly, leading to renewed fears of a reignited war between the Galactic Republic and Sith Empire. Both factions have reportedly redoubled their efforts to hoard supplies, munitions, and fuel in anticipation of renewed hostilities. Resource shortages, already a common occurrence on many core worlds, are becoming a daily reality across the galaxy at large. With no single unifying threat to motivate their continued cooperation, these tensions have led many of the Alliance's forces to return to their original sides of the age-old conflict, rejoining their longtime allies and waiting with grim certainty for the war to begin anew. This Imperial deep space installation was once capable of intercepting and decrypting a staggering volume of enemy communications. Its existence and location were highly classified. After the Eternal Empire's invasion, the station's staff was relocated and never replaced, and the station itself was forgotten, a victim of the secrecy that once protected it--there was no one left who knew that it needed to be staffed in the first place. Sensors have detected energy signatures from the station's equipment that do not match any known Imperial technology, likely the result of modifications made by the station's mysterious new occupants. The original source, purpose, and capabilities of these modifications are unknown. Formed by Vinn Atrius, the Order of Zildrog is highly secretive, militantly organized, and ruthlessly dedicated to a single purpose: the death of the Outlander who now commands the Eternal Alliance. The group's membership is mostly made up of Zakuulan hardliners like Atrius who blame the Outlander for destroying the civilization that Valkorion built for them. Their numbers include Knights and soldiers from the Zakuulan military, cultists from fringe groups like the Heralds of Zildrog, and even a handful of individuals from the Core Worlds with personal vendettas of their own. Unified by their singular hatred and the countless lives they've seen ruined in the Outlander's wake, the Order will stop at nothing to complete their mission of vengeance. The few surviving Zealots who once served Valkorion in his Nathema stronghold now eke out a bleak existence in the planet's abandoned wilds, where they live in fragmented tribes. Although each and every one of the Zealots felt Valkorion's death vividly through the Force, all of them refuse to believe that it has actually occurred. Wild and improbable theories about his current state of existence and how best to continue serving him have driven the Zealots into forming rival, warring groups who raid and kill one another interminably. Ironically, all of the Zealots still alive owe their survival to their master's death and the subsequent blooming of life on the planet's once-barren surface; otherwise, they would all have starved long ago. The ancient mechanical entity known as Zildrog has always operated from behind the scenes. Unlike the other "machine gods" of Iokath, Zildrog permanently functions in two forms. The first is a central computer that specializes in the transfer of life energies. Given this device's presence on Nathema, it is likely that Zildrog was a key element of the original ritual Tenebrae used to empower himself at the cost of all life on the planet. Beyond that first atrocity, however, Zildrog's central mind appears to have played no role in Tenebrae's dual life as Vitiate and Valkorion, and slumbered in stasis mode until Vinn Atrius discovered it many years later. The second of Zildrog's forms is the ancient warship known as the Gravestone. Though it can be operated by an organic crew when required, the vessel's Dark Heart functions as a remote command core that allows Zildrog to control the ship as an extension of itself. Ancient Zakuulan myths often confuse or conflate Zildrog and Izax, likely because both entities are aerial platforms employing omnicannon technology. 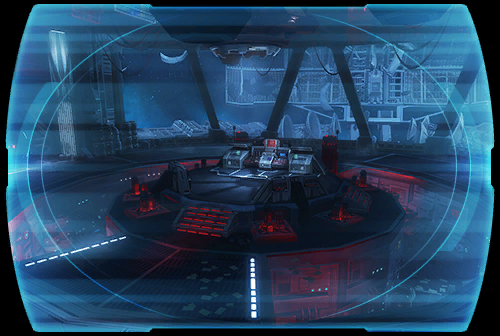 Given the many differences in their construction and operation, it seems likely that they were actually built entirely separately--perhaps even as rival projects carried out in Iokath's endless pursuit of better and deadlier weapons.